Celebrate We Will: Who Nose? I really really really want to pierce my nose. 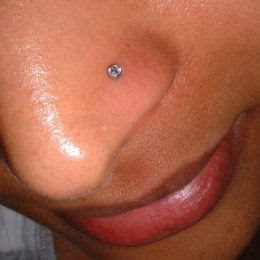 I'vI want a small diamond stud just like this one. I've always kinda wanted to, but for some reason today...I just really need to. It's small and cute and I know I would LOVE it. Hmm...dress code at work doesn't exactly allow for it....buuuuut. sigh. Maybe they won't notice?? I got my hair done yesterday, and the girl who cut it had one. It was so cute. Hmm, whadaya think the 4th grade teacher and the accountant with nose rings? I say, go for it! Life is too short to live in the confines of some stupid rules. Worse case senerio: "Mrs. Addison, please remove your nose ring."